When young Mariano Medina witnesses a vicious attack on a girl he adores, he flees in inexplicable terror. Fifteen years later, as a grown man training horses along the Oregon Trail, he has a chance to redeem his youthful act of cowardice. Another woman, whose mysterious “ghost stare” exerts a powerful attraction, is captured by a band of Ute raiders. To help her he must overcome his cowardly urge to flee. If he succeeds, he faces another painful dilemma: Betray the woman’s likeable husband and his own sense of honor by asking her to leave with him, or travel on without her. That choice, in turn, leads Medina back to the land of his childhood, where he must confront his darkest fears and uncover the hidden source of his panic in the ghostly stare that haunts his dreams. This is the story of a man’s quest for courage, respect and love in an unforgiving land. Based on real characters who lived on the frontier during the lead up to America’s 1846 war with Mexico, David M. Jessup has woven a spellbinding prequel to his prize-winning first novel, Mariano’s Crossing. Mariano’s Choice will be available for purchase in September 2016. Mariano’s Choice isn’t your typical Western. And Mariano Medina isn’t your typical Western hero. Rather than fearless and invincible, he is timid, often uncertain, and occasionally cowardly. Medina and other historical Westerners serve author David Jessup well as he spins a gritty, sometimes painful tale of an ordinary man facing unwelcome change as the fur trade era gives way to immigrant wagons and the United States seeks increasing influence on the Mexican frontier. This book reveals the Old West through the eyes of a regular frontiersman and the result is a richer, more realistic interpretation than the overwrought, myth-driven view we see in so many Western novels. Jessup is a master historian and writer—and this gorgeous novel proves it. What mesmerizes most is the depth of understanding and love of the West, which therefore includes the untold stories, the filling-in of an incomplete history. In Mariano’s Choice, we discover the peoples who are often minimalized by mainstream historical fiction but which are essential to an understanding and love of the real and varied West. In vivid and gorgeous prose, we encounter the world of the late 1800s and the men and women who literally shaped the West. We also find a tale of love and the power of redemption. History, place, love, forgiveness, healing: this book has it all. I loved it. Mariano’s Choice continues the saga of Mariano Medina, a man both ordinary and extraordinary. Author David Jessup’s fluid, compelling prose takes the reader back to another time, to share Medina’s adventures and adversities. I hope someone has the sense to produce this as a mini-series. It’s too rich and complex to fit into a two-hour movie. Lucia St. Clair Robson is a New York Times best selling author of Ride the Wind, which was included in the 100 best westerns of the 20 th Century, and winner of the Spur Award and Owen Wister award of the Western Writers of America. What strikes me first about Mariano’s Choice is David Jessup’s writing. Elegant isn’t a word one would usually associate with a novel of the 1800s, yet that’s the word that comes to mind. Next, I’m taken by the pace of the story, and the authenticity of the characters. It moves, and they’re so believable. Finally, the plot is riveting. The historical basis just adds to it. If Mariano’s Crossing was an award-winning first effort, Mariano’s Choice – the prequel – should join it on the judges’ stand. In Mariano’s Choice, David Jessup weaves a tale of one man’s regrets and eventual redemption. Mariano Medina, a real-life settler in mid-1800s Colorado, makes a number of choices in his life that he deeply regrets and that cause him much shame. Events in his life offer him chances to prove to himself and others that he does have the courage and the resources to “do the right thing,” enabling him to redeem himself in the end. Jessup’s depiction of the Colorado frontier and Medina’s life pulls the reader in and won’t let go. From descriptions of breaking horses to episodes highlighting the blatant bigotry towards women, Hispanics, and Native Americans that was the norm of the time, Mariano’s Choice offers a no-holds- barred look at frontier Colorado. One can almost smell the sagebrush. David M. Jessup adds flesh and blood to the bones of one of the West’s legendary mountain men. Mariano Medina has not one choice, but many, as he stands up to violence and prejudice—and to his own cowardice. He must choose between fear and friendship, safety and honor, and loyalty and love in this tightly wound novel of the Old West. 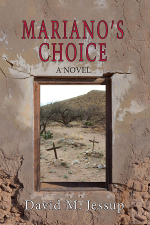 Mariano’s Choice is a bold story about the west as it existed before the Western, a story about a raw land populated by rugged folk, men and women, native and immigrant, living alone and in community. Jessup’s cinematic eye for detail and his gift for gut-wrenching, heart-pounding storytelling pulls us seamlessly into a world of danger, beauty, and unbounded possibility—for success and failure, for betrayal and redemption, for love and hate, and for life and death. 1. Historical fiction sometimes suffers when authors dwell too much on historical fact at the expense of a good story. On the other hand, fiction can sometimes veer too far away from the facts. What kind of balance between fact and fiction do you find in Marino’s Choice? 2. What are the main goals Mariano Medina is striving to attain? What motivations– both conscious and unconscious– fuel his efforts to continue the struggle toward these goals? 3. What happens to Mariano when he becomes discouraged and loses hope? 4. What are the sources of Medina’s attraction to Takánsy? 5. What are the central dilemmas faced by Mariano Medina? What values influence the choices that he makes? How does the past influence his choices? 6. What is your favorite scene in the book, and why? What major emotion does the scene evoke in you as a reader? 7. How do both Mariano’s body memory and his mind help Mariano cope with early childhood trauma? How do they hinder him? 8. What parallels and differences exist between the period leading up to the 1846 U.S. war with Mexico and current border issues? 9. What did you learn about the time period in which this story unfolds? What surprised you about Fort Bridger, El Pueblo and Taos that you didn’t know before?